A multi-millionaire has built an office headquarters designed to look like the Starship Enterprise from his beloved TV and film series. Liu Dejian, the Chairman of China’s most popular mobile internet provider, obtained the license from CBS to allow him to build a replica of the spaceship, as reported in People’s Daily Online. 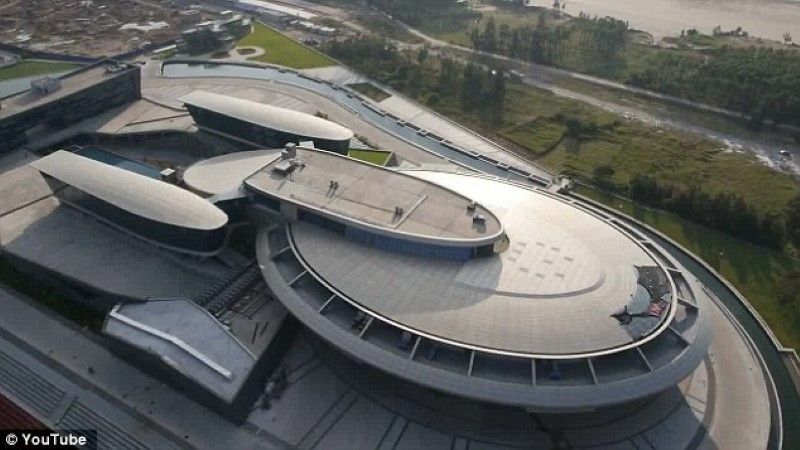 Liu, 43, a huge fan of Star Trek and a self-described ‘Uber Trekkie’, spent approximately £100 million on this office building, located in China’s Fujian Province, to pay homage to the franchise. One of the first people to develop the Chinese internet gaming market, Liu’s family has a £390 million fortune – richer than the Queen of England. News of this magnificent architecture broke when a Star Trek fan spotted a satellite photo on the internet. Drone footage shows the view of a relatively ordinary building on the ground but an impressive aerial view of the replica. The architecture is as big as three football pitches, with a 30-foot metal slides from the third floor to the ground floor and automatic sliding gates between each working area. According to the spokesman of NetDragon Websoft, the company spent six years building the ‘Enterprise’. Ground was broken in 2008 and the building finished in 2014 as the company’s new headquarters. Mr. Liu is described by the Chinese media as a ‘big child’. His former office was reported to be filled with fun gadgets: segways, pinball machines, batman toys and a private cinema. His Star Trek obsession started when he went to the University of Kansas for his chemistry degree. He lived in the United States for a decade before going back to China to develop his Internet and gaming empire. His very own enterprise, a listed company on the Hong Kong Stock Exchange, sell its smartphone mobile network, 91 Wuxian, to Baidu, the Chinese equivalent of Google, with £1.2 billion. This is the biggest acquisition in the Chinese internet history. The building looks ordinary on ground level, but fans have commented on the level of similarities from the spaceships in the Star Trek movie and TV series.